Dogs are already aware of the scents around them, but need to be taught to give an indication to a specific scent by way of training and commands. We offer specialized scent detection for qualified individuals wishing to use their dogs to identify specific scents, such as: narcotics, arson, and bomb detection. For example, if you were to walk into a florist shop your nose would make you aware of the combined fragrances put off by each individual flora. Your dog can go into the same shop and with the use of his nose, identify where the roses are kept. The sensitivity of a dog's nose is immeasurable by any instrument known to man, and it is unlimited. In their book, Scent, Hugo Verbruggen and Milo Pearsall provide the following explanation on the sensitivity of a dog's nose. "If one were to take a single gram of butyric acid, which is contained in human perspiration, and spread it over the entire city of Philadelphia, your dog could smell it anywhere, up to an altitude of 300 feet." Items which are declared "unscented," such as deodorant sprays, may be detected by a dog. 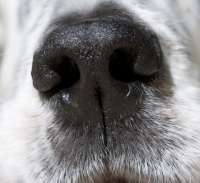 Although humans cannot smell the scent, a dog can. Narcotics training is offered to individuals who are working for, or in conjunction with, Law Enforcement, or Private Investigation Services. Proper identification and/or licensing must be provided prior to acceptance. Dogs are taught to alert to a variety of illegal narcotics. Our course is patterned in conjunction with those of the National Narcotics Detector Dog Association. Departmental Training is available. Arson training is offered for those individuals who are working for Fire Departments or Private Investigative Services. Proper identification and/or licensing must be provided prior to acceptance. Our method of training is based on the training provided by the Department of Alcohol, Tobacco, and Firearms, and those of the State Farm Insurance Company. Departmental Training is available. Bomb detection is based on the methods utilized by the Armed Forces. This course is offered to Law Enforcement, Fire Departments, and the various branches of the military. Proper identification and/or licensing must be provided prior to acceptance. We also offer training to individuals, or groups where no special licensing is required, such as: tracking, blood trailing, search and rescue, cadaver, articles, termite, peanuts, etc. "If it has a scent, we can train the dog." The length of all attended courses is 6 one hour weekly lessons where you are taught step-by-step what is needed to achieve your goal. You will be required to work with your dog throughout the week prior to returning to class for the next lesson. Specific knowledge required for working your dog in your chosen field of endeavor and direction to informational sources are provided for each individual. Keep in mind that we are training the dog. Individual must educate themselves in the finites required to perform their chosen task. For those individuals that cannot dedicate the time to working with their dogs, we offer a boarded training course where the dog remains with us for 4-6 weeks of training. The amount of training time depends on the aptitude and drive of the dog. We care for your dog as if it were our own. We provide food, water, and exercise for the length of his stay. Prior arrangements must be made to ensure availability. Proof of vaccinations and Bordetella must be presented prior to entering the kennel.